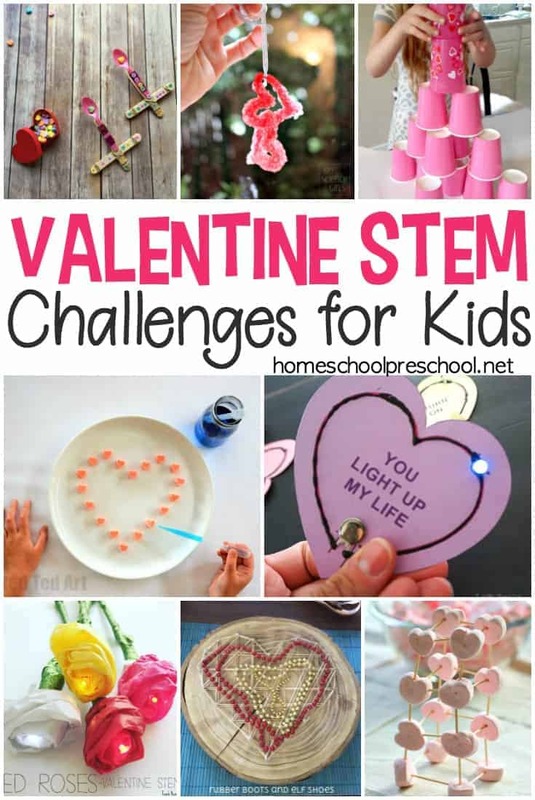 This collection of hands-on, educational Valentines activities for toddlers and preschoolers will keep your young learners engaged for hours! 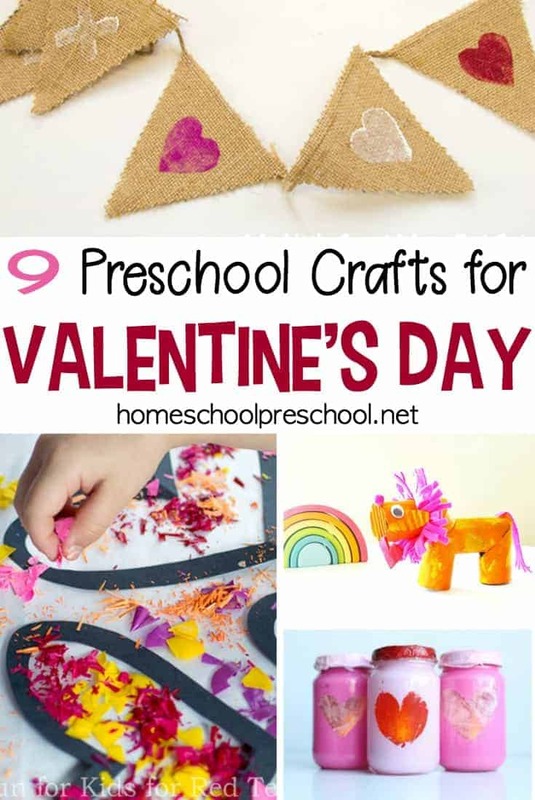 Whether you’re focusing on fine motor development, counting skills, or name recognition, the preschool Valentine activities featured below are just what you need. Scroll down to discover 20 educational activities that are perfect for your Valentine’s Day units and lesson plans. Toddlers and preschoolers will enjoy this Threading Hearts Busy Bag activity. It’s easy for mom/teacher to prepare, and it’s a great way to help little ones develop fine motor skills. Mix up your arts and crafts time with some fun Pipette Drip Painting. Kids will work on fine motor skills, color mixing, pattern making, and more. Encourage little ones to focus on details with this Valentine Bead Sort. They can sort by size or by color. Add tweezers for transferring the beads, and you’ve got an activity that will build fine motor skills, as well. Using tweezers to transfer items isn’t just great for fine motor skills. It’s also a great way to promote pre-reading practice. Read more about it, and then set up your own Valentine Fine Motor Transfer Activity. Your little ones will be so excited as they turn an ordinary paper plate into a little Love Bug in this toddler-friendly craft. Have you shown your preschoolers how to play tic-tac-toe yet? If not, now is the perfect time. They’ll love making their own Valentine Heart Tic-Tac-Toe boards to play on. Whether your preschool is Montessori or not, these Valentine Montessori Activities will help your little ones work on graphing, patterning, counting, and much more. Choose one of these four Valentine’s Day Alphabet Games for Kids to use with your preschoolers. They include a mystery puzzle game, a letter search game, sticker matching, and a roll and write game. Building sight words has never been so fun! This Candy Heart Playdough Sight Word activity features 40 preprimer sight words. Preschoolers and kindergarteners will practice building patterns with hearts with this Heart Patterns Free Printable for Valentine’s Day. Gather your felt, pom poms, buttons, beads, and googly eyes for this activity, and your kids will spend hours with this Love Bugs Sticky Play activity! Your little ones will be eager to explore the ideas shared for these 14 Heart-Themed Tot Trays. This little Love Bug sits on a heart-shaped “log”, and he’s ready to play with your preschoolers! This Valentine Name Puzzle combines scissor practice with name recognition for a fun preschool Valentine’s Day activity. Send your little ones on a Valentine’s Day Alphabet Scavenger Hunt. This is a great way to introduce positional words like beside and above while focusing on letters and their sounds. 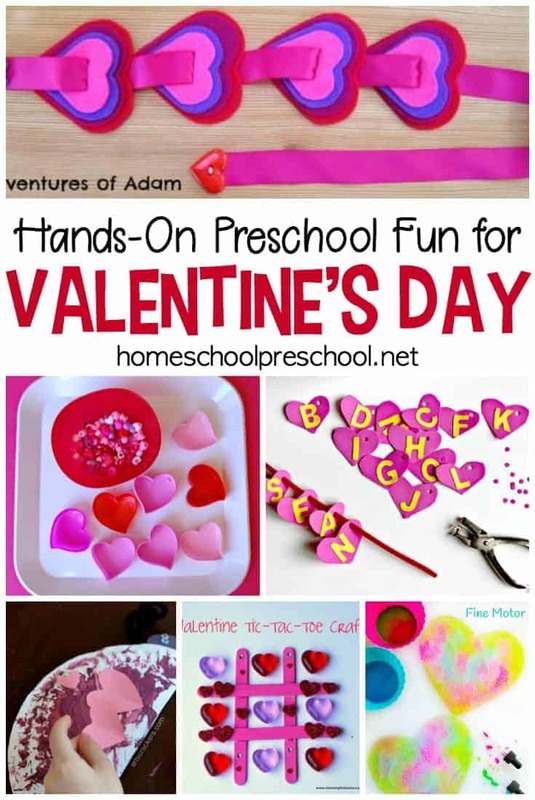 These five activities focus on Valentine’s Day Fine Motor Skills. With just a few simple supplies, you’ll be ready to engage your little ones. Sensory bins are a great way for little ones to explore different textures and to practice scooping, pouring, and sorting. 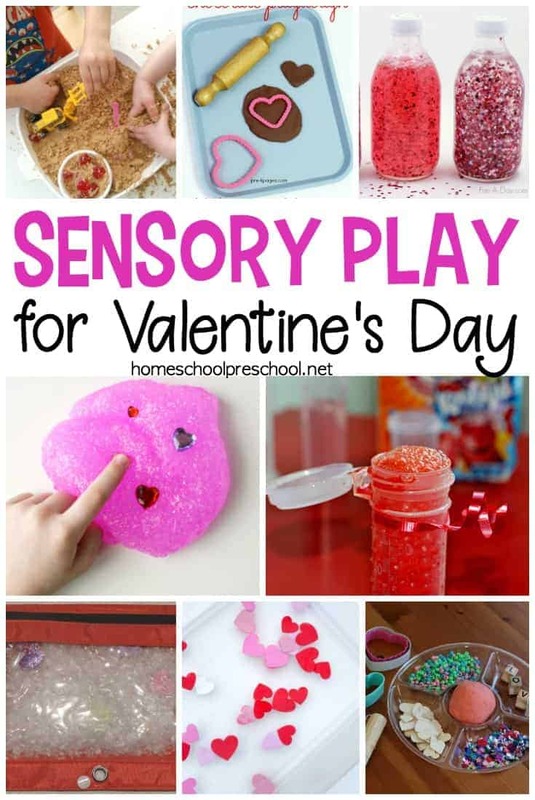 Set up this fun Valentine’s Sensory Box and see what your tots and preschoolers do. With one simple printable and some foam heart stickers, you have everything you need to set up this Valentine’s Counting and Color Sorting Activity. Engage your littles with music and rhymes with these Valentine’s Day Songs and Rhymes for Circle Time. Help your little ones learn to discriminate between different sounds (and find matching pairs) with a Montessori-Inspired Sounds Matching Game. 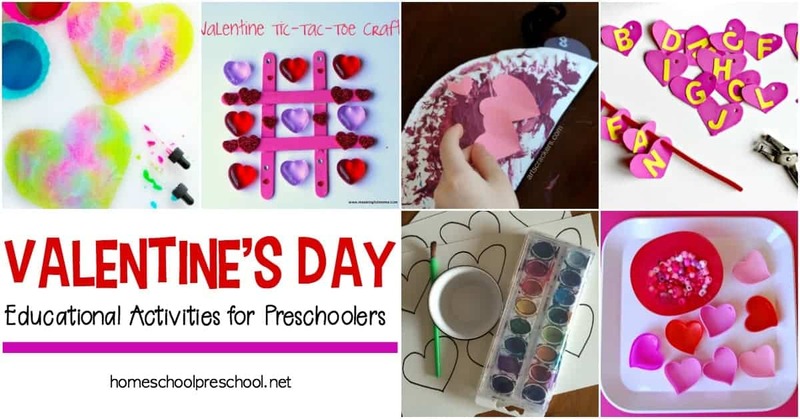 With so many hands-on, educational Valentines activities for toddlers and preschoolers to choose from, which one will you choose first?